All members of the City Council sit on various boards and commissions within the region and represent the interests of Elk Grove. On each City Council agenda, there is a place where Council members report back to the public (and their fellow Council members) on those meetings they attended and the jest of what was discussed. This process of keeping the citizens informed of regional developments as they relate to Elk Grove is what I refer to as “transparency.” At last night’s city council meeting, Councilmember Pat Hume neglected, or if you ask him, forgot to mention his attendance at the SacramentoLocal Agency Formation Commission (LAFCo) meeting of March 1, 2017. What makes this omission even more incredulous is that he serves as Vice-Chair of this commission and there are several large Elk Grove sphere of influence (SOI) applications pending before the Commission. The LAFCo agenda of March 1st that Hume ‘forgot’ to mention included a public hearing on the Draft Environmental Impact Report (DEIR) for the Kammerer/99Sphere of Influence (SOI) application. This application is to expand 1,200 acres south of Kammerer Road. beyond our current city limits. The future expansion of the city to the south, combined with a current application to expand the SOI to the east is worthy of a few minutes of the Vice-Chair’s time I believe. This is huge for residents of Elk Grove when we discuss the expansion of our city limits which would include providing all the services to the area such as police, sewer, water, and power. The DEIR for this SOI application relies heavily on the City’s pending General Plan and General Plan update which references the undeveloped areas south and east of the city as “study areas” to consider future annexation. The city’s general plan update process has included this 1,200 acres as a “study area” and during 2016, the public was invited to participate in a guided discussion of how city would grow. The “growth process” has apparently begun with this SOI application and yet our City Council, especially Councilmember Hume, has not suggested to staff to coordinate city outreach efforts with LAFCO in hosting meetings here in Elk Grove. Nor has anything been mentioned or said about the status of the general plan update. Mum has been the word. Hume also failed to inform the public last night that LAFCo will be conducting a second DEIR public meeting here in Elk Grove on Friday night March 10th. For what reason is there an apparent lack of transparency regarding the several SOI applications which will forever change the landscape of our city and surrounding areas? What keeps Mayor Steve Ly and City Council from informing the residents of the entire process surrounding “study areas.” How come we are only allowed to participate during certain points of the process? As a taxpayer do you want to allow a few developers to determine the direction of our city? This indeed will be the case unless residents become engaged in the process. How can we as residents become aware of the SOI applications and plans if our City Council and Mayor filter and forget to make public important meetings such as this one? Sacramento LAFCo will be hosting a workshop this Friday March 10 from 6 - 7:30 p.m. at the Wackford Center seeking public input on the Kammerer Road/Hwy 99 SOI Draft Environmental Impact Report. Good for you Lynn Wheat, Citizen Planner! Pat Hume "forgot?" Give me a break. Pat Hume lives for the Connector and the SOI. 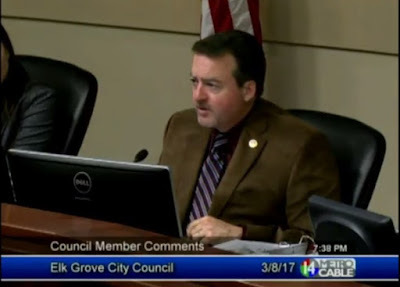 Most believe those are his sole purpose for being on the Elk Grove City Council as the "developer's delight" and these two highly significant developer-interest projects.